Zhyla : Having completed quite a bit of work on that parlor guitar somewhat successfully it's time to work on my Harmony H950 archtop guitar. I don't really play this guitar any more but the point is to practice the neck reset procedure with an archtop before I take apart my beloved H1327. While I have the neck off I will also refret it since the frets are pretty low and it appears impossible to refret an archtop without removing the neck. Hope the guy who owns this after me appreciates it :). The threaded posts have become angled resulting in the bridge tipping forward. It's not the posts themselves that are bent but the hole they're threaded into has distorted. 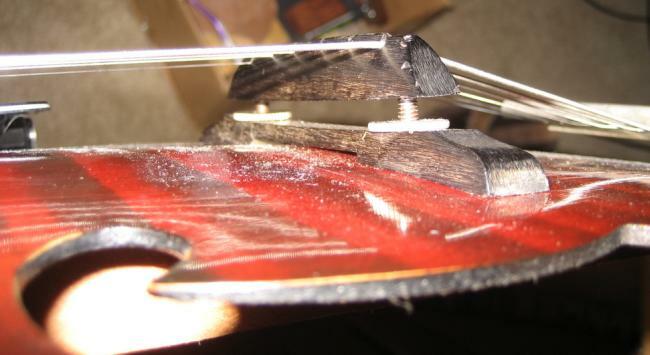 I think this is a problem with maple bridges, the wood just can't handle that kind of pressure over time. 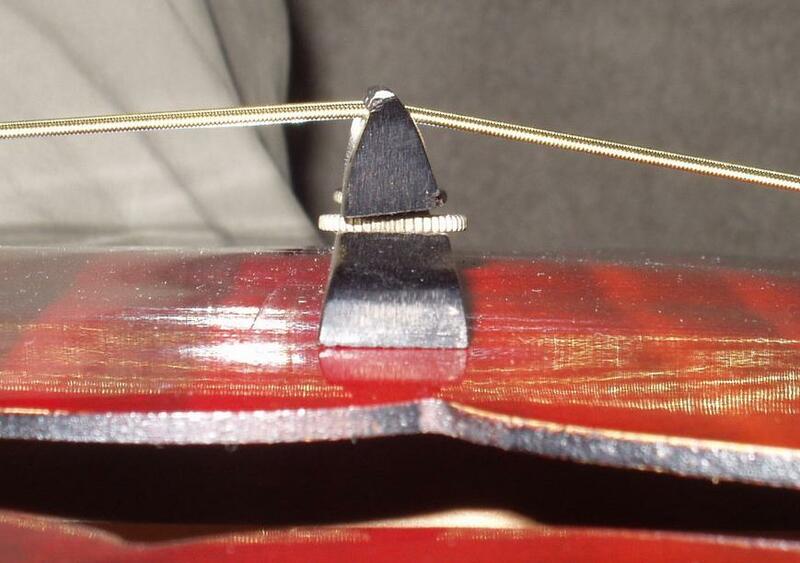 I think the rosewood bridge on my old archtop is still vertical. - Cleaned out the post holes so the posts can be vertical. This involved destroying the threads in the hole. - Taped over the bridge so I don't get epoxy anywhere on accident. Masking tape removes little bits of ebonized bridges so I won't be doing this again. It still looks ok but I should have only put the tape on the bottom surface. - Smeared the nuts with vaseline. How many times do you get to say that on guitar forums? 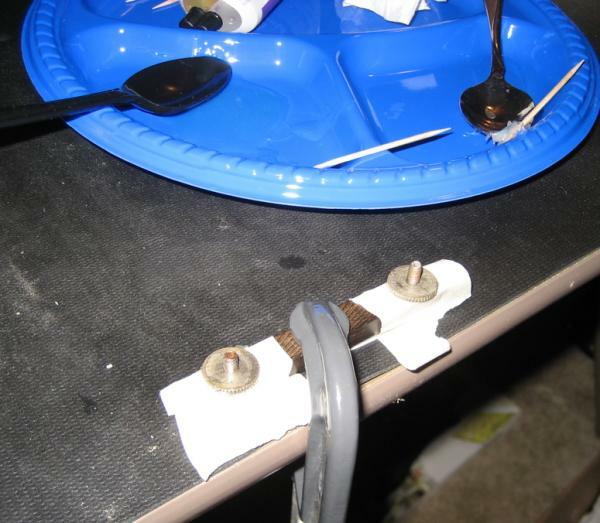 This prevents any epoxy from squeezing out and gluing the hole assembly permanently together. - Put more than enough epoxy in the holes and screwed in the posts. I'm using ACE "plastic repair" epoxy but I'm sure any two-part concoction will be strong enough. - Screwed on the nuts all the way so they make sure the posts are 100% vertical. 24 hours later it's all dry and the nuts aren't stuck to the bridge. Success! Terrible action as you can see. But now that I can raise the action up I can hear what this guitar sounds like with some tension. It's better, the bass end is much improved. I think with some new frets things will improve as well. But I'm not expecting this to ever sound all that great. I think the type of epoxy used in this application isn't too important since it's really just filling space, not bonding things together that are being pulled apart. If there's a one-part Loctite product that can do the job that would be convenient. Got around to the neck removal step this morning. This time I put the steam hole in the 15th fret off to the side. It went straight into the neck pocket and I was able to stick a wire about 2 inches down that hole (which I had only drilled about 3/4" deep). Bullseye ! Disaster! What I did wrong was not separate the fingerboard extension from the top before pulling the neck out. I got lucky, could have been a lot worse. Not terrible. This guitar isn't especially valuable or dear to me so I'm actually glad I learned my lesson on it. I actually thought about separating the top first but wasn't sure how to go about it. What's the right tool/method for that? I haven't seen any examples online about this. Another problem I have here is the steam came out all over the place and damaged the finish in a strange way. You can see a bit of it on the bass side in the above picture. What looks like fingerprint smudges is actually a haze from the steam. Not sure what happened. Do I need to use distilled water to keep from some impurity in the water from vaporizing and affecting the finish ? About the finish, I don't know what happens with black ones. For years I use a furniture product to clean and polish guitars. It always worked fine, excepting the black guitars. I gave it up for such colored ones. They need to be rubbed and polished again. Anyone knows why? Zhyla : I assumed it was a nitro finish like any other Harmony. Is that not true? Now that I am looking at it, it's lacking that crackling effect that my little parlor has. I assume 45 years is enough to get a nitro finish to crackle. I have the fretboard all defretted. Maple is much easier to work with than that brittle beech fingerboard on the parlor. 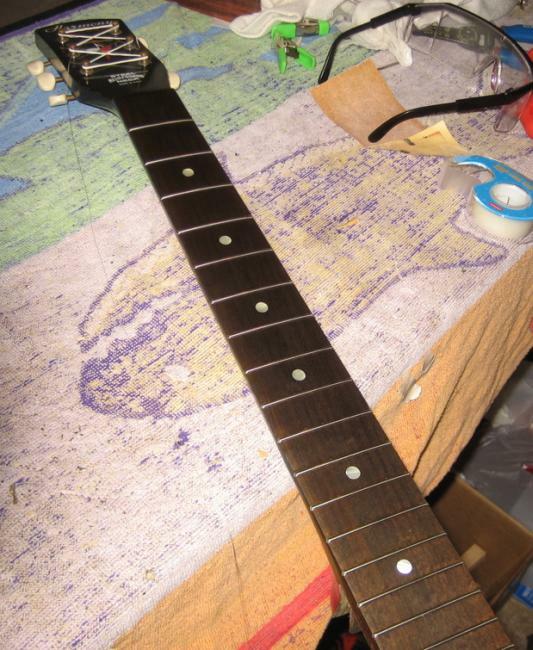 It still tends to chip a bit as the frets are pulled out but in only a few cases I had to glue the chips back down. 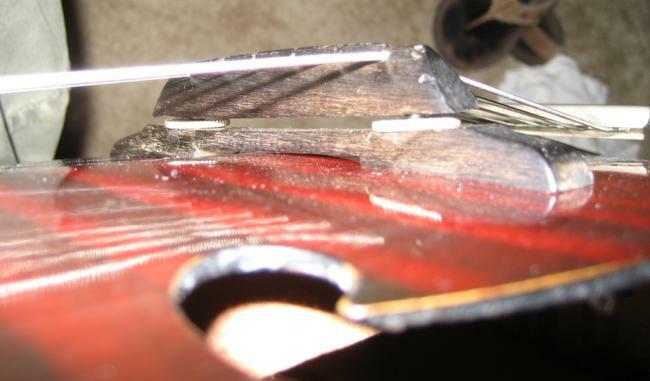 99% of the chipping is short enough to be covered by the frets. Ebonized maple? That's what I assumed it was before I sanded it down. I see little resemblance to my tele's natural maple fretboard but maybe the ebonization brings out the tight grain that you don't normally see. I was worried I would have to re-ebonize or stain it after sanding but I like how this looks just fine. I think I'll just keep it oiled and see how it does. Or should I seal it with something? My tele has a hard (urethane?) finish on it which makes it a little too smooth and sticky, I'm having a hard time getting used to that. Figured I'd post some pics of the refretted neck. This went way faster than the previous refret because I got myself a set of files with a big long flat file. $10 for a 8-piece file set at the Home Despot really made my life easier. The pearloid dots now look very nice. You can't tell in the pictures because they're overexposed but now that they're polished and flush with the fretboard it doesn't look quite as "budget" as it did before. I was initially worried I'd need a radiused sanding block and a fret bending tool. I found that I could follow the existing radius fine during the sanding step but it does take some attention. The frets I bent using the nippers that I use to defret to hold the fret in various spots and my free hand to bend the fret. Very easy and only a little tedious. 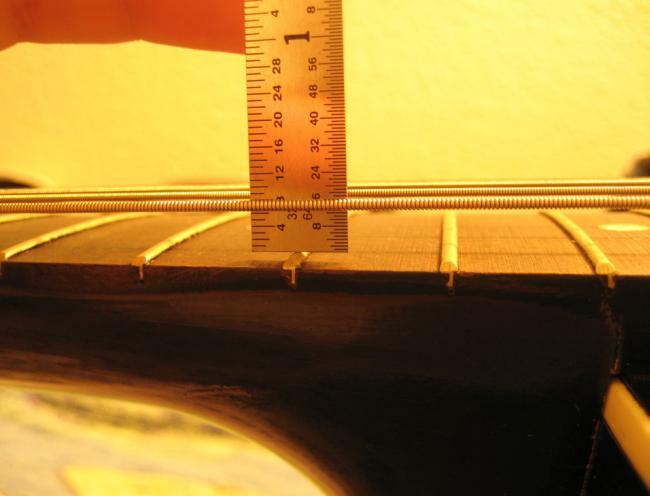 Since the goal is to over-bend the frets anyways this doesn't need to be very accurate. 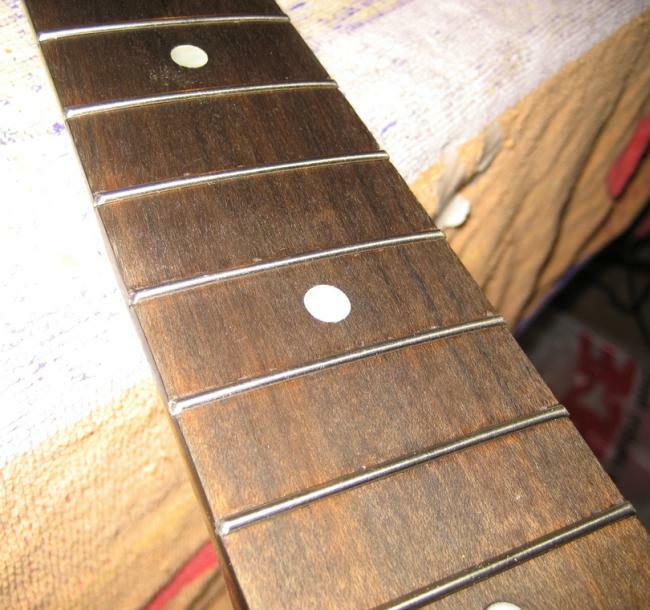 The one problem I'm having with refretting is getting the frets filed flush with the sides of the neck. The tang especially tends to not be quite flush. It won't catch your fingers when you play and it's not sharp, but I'd like it to be undetectable. I can't really file up against the side of the neck because it's painted. Suggestions? I'm about 1/4 done with the neck setting step, hopefully will have this finished off next weekend. I'm using another file to do the material removal on the heel. It's a little slower going but way more controllable than the chisel (at least in my hands). I really doubt these fretboards are ebonized maple. Edmatts talked about a variety of woods used for fretboards, but I cannot remember them right now. But this one, like in the Broadways, doesn't look like maple. Zhyla : Ok, in neck reset land I've got the neck angle about right, just tweaking the heel to get a really good fit against the body. It didn't take much to get the angle in good shape. 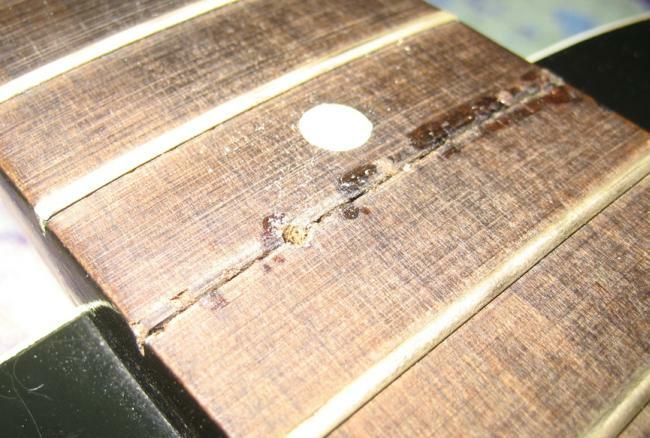 The parlor guitar I worked on previously was in much worse shape. I did a lot of the work with the file pictured below. This goes pretty fast but tends to rough up the heel edges if you don't take it slow. It's essentialy a thousand tiny chisels glued together. 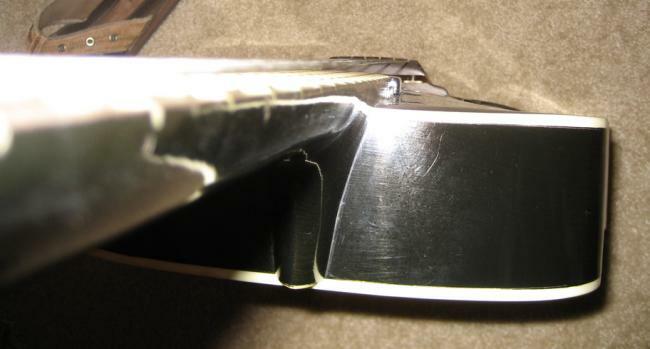 One downside is that it cuts completely flat and the shoulders of these old guitars usually have a little bow to them. So I use the chisel to attack the parts where things aren't seating well. One note about the chisel work. 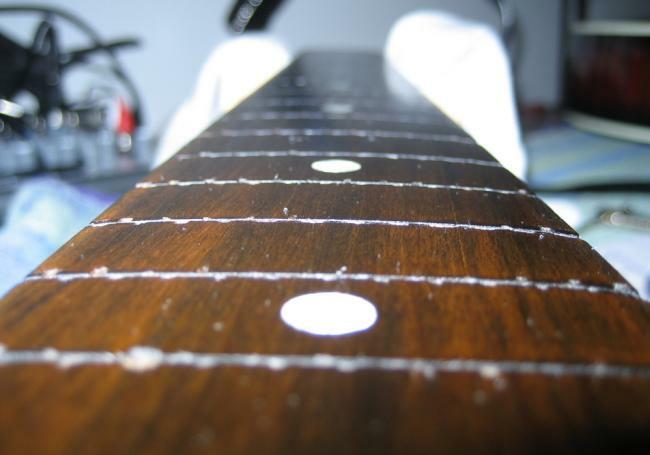 The frets.com article confused me; I thought they were saying to chisel the neck angle in one cut. This is nuts. I've been using it more as a scraper and it works well, just nudging it forward over and over. It shaves off material rather quickly and is very controllable. So I could see doing the entire operation with a chisel. Something interesting from the 2nd picture. 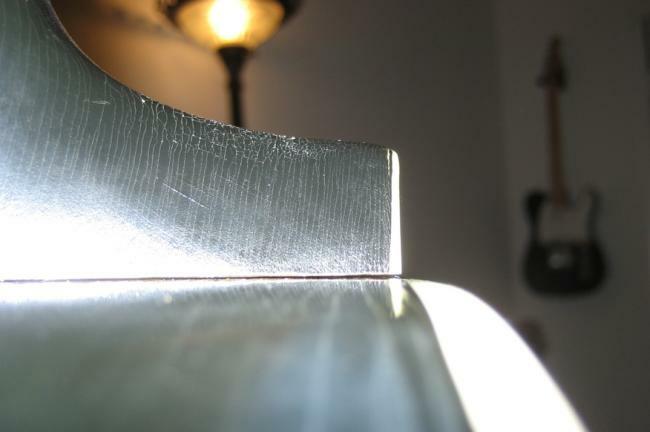 See those places where it looks like a rat gnawed the edge of the dovetail? 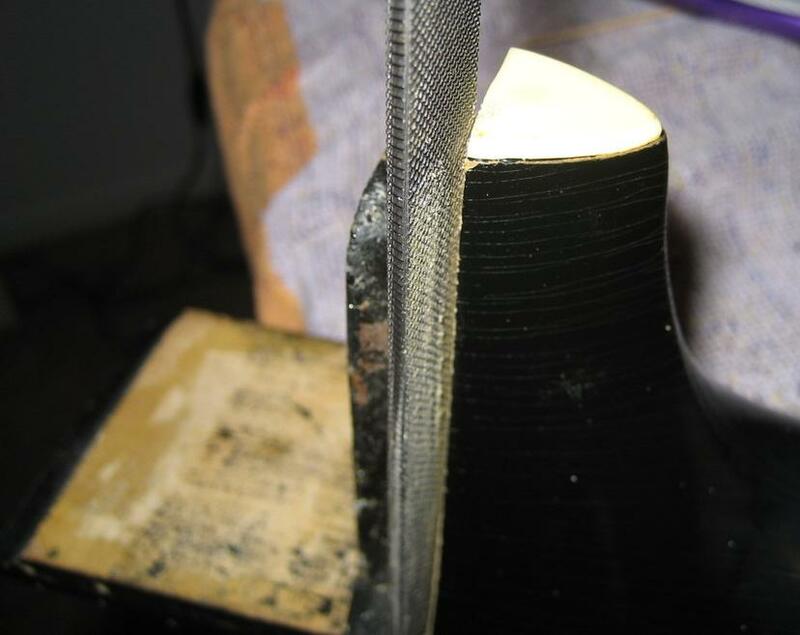 That's where the neck pulling forward against the joint chipped away some material. I saw this on the parlor to a lesser degree. Now here's the interesting part: it's only happened on one side of the dovetail and the debris from the chipping is nowhere to be found. On the parlor I did find the matching chips still glued in the joint. That together with the cuts in the corner of that dovetail (which looked that way before I started on it) suggest to me this guitar has had a neck reset before by someone far more skilled than me. I bet he wishes I hadn't jacked up the top :). Now I'm off to find some hard wood veneer to shim the joint with, polish up the joint a bit, and glue it ! k1w1 : Great stuff Zhyla, this is such an eye opener and you have showed me what to avoid. How did you calculate how much to take off ? Zhyla : You know, I was thinking about how to measure the necessary change in the neck angle and use that to guide the material removal. But so far I've just been changing it a little at a time and checking it very couple minutes. You want to check frequently just to make sure you're keeping it even on both sides. I've actually had this project done and strung up since Sunday but my wife stole the camera :). Ok, first off I would like to complain that there is no place to buy hardwood locally that I could find. I went looking for veneer to use for shimming the neck joint and ended up in a "lumber" store which had no wood anywhere in the building arguing with a "lumber" salesman who claimed he'd never seen "veneer" which wasn't 3/4" thick and made of wood particles. Ugg. 6 sq feet of maple veneer is on its way from the wonderful ebay. So I ended up chiseling off thin pieces of my rosewood block, sanding them down a bit thinner, and gluing them to the dovetail of the neck. I forgot to take pictures but they were about 1/2" x 1". More about that later. 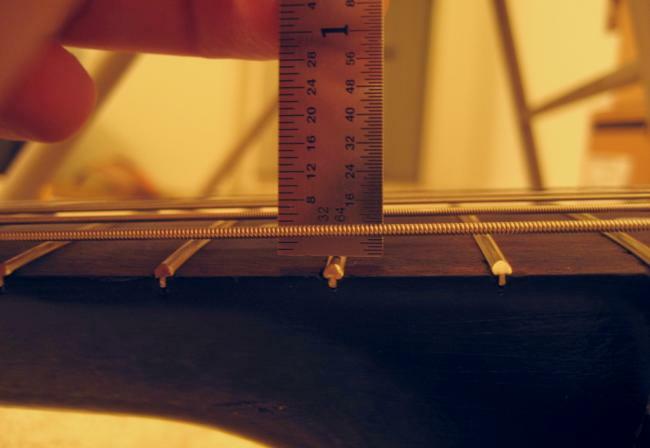 The string height at the 12th fret went from 13/64" to 7/64", putting it in the very playable neck of the woods. There is room to adjust the bridge lower but there wouldn't be enough clearance above the pickup that I bolted on. But the bridge was supposed to be much higher when this was all done. What happened? It would appear I again didn't shim as well as I should have. I made the shims thick enough that I could barely press the neck into the joint with my hands. Not good enough? When I set the neck I used a clamp to press it in and it took a bit of work. So I'm a little confused by this. I think I'm going to ponder it a bit before doing another reset. Perhaps the shimming just needs to be tighter? Or longer? Rosewood is a dense wood, I doubt it compressed much. Is the neck block bending a bit? You can't really tell but the heel fit very snugly against the body, I'm pretty happy with how it turned out other than what's described above. Sound-wise, the acoustic sound definitely improved. It sounds a lot snappier, a lot more attack I guess. I think it's mainly having decent frets that made the improvement since the bridge height didn't change much. The electric sound improved too. The action is easy enough that you could play it like you would a normal electric guitar. k1w1 : You know Zhyla, with those guitars that have the fretboard extension glued to the body, not floating, perhaps you have to take enough off that you have to shim the overhang, looking at my 950 I reckon I would have to lift enough to get maybe a 2-3 mm shim in there if not a bit more. A random thought, sound logical :??? :??? 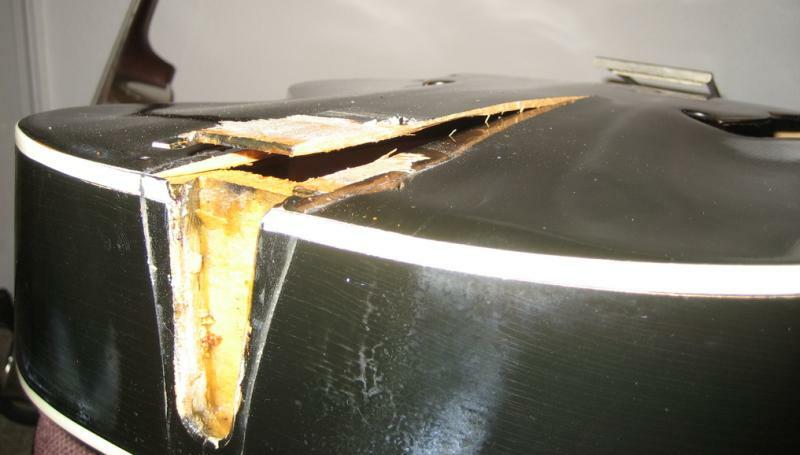 Fran�ois : Very interesting Zhyla... Could you say more about these shims. What shape exactly, and where did you used them ? If you don't have photos, perhaps a drawing could help ? 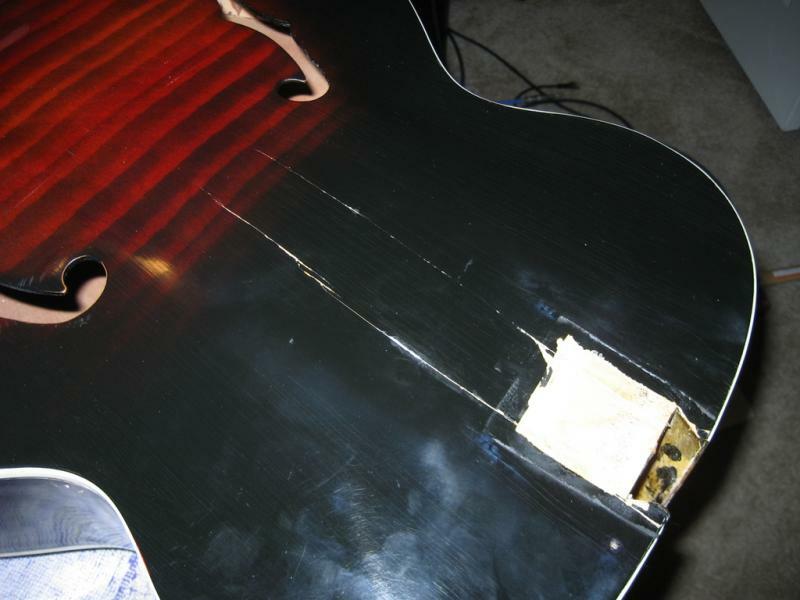 Also, on your flat top you said you restrung it and played/tried the guitar before glueing back the neck. Did you proceeded the same here ? Is it glued back now or..? 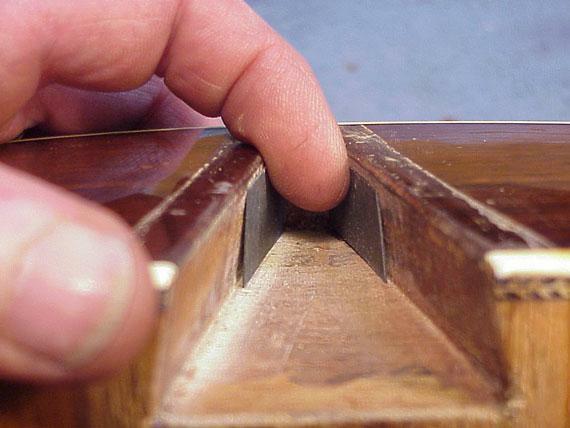 Zhyla : Here's a shot from Frets.com of the shim technique. 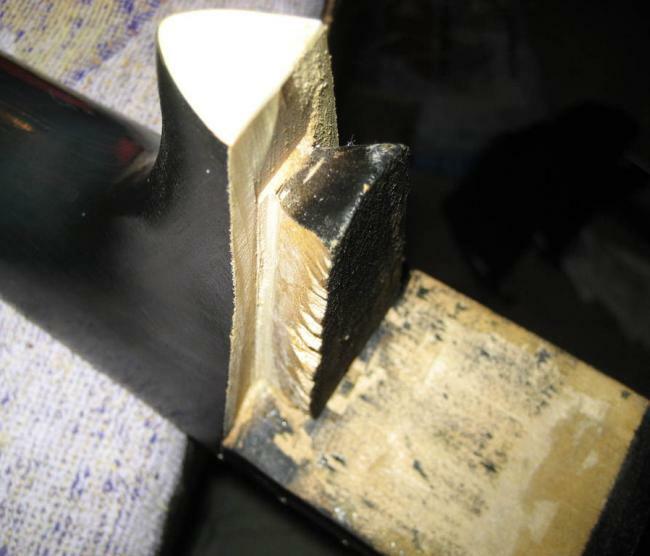 On my guitars I didn't have veneer available so my shims are in two pieces and don't wrap around the end of the heel. No, I didn't string this one up prior to gluing. There is enough upward force on archtops that I didn't think it was a good idea. Kiwi, I don't think shimming under the fingerboard extension is a good idea. That's not the structural part of the neck joint and it doesn't have much leverage. 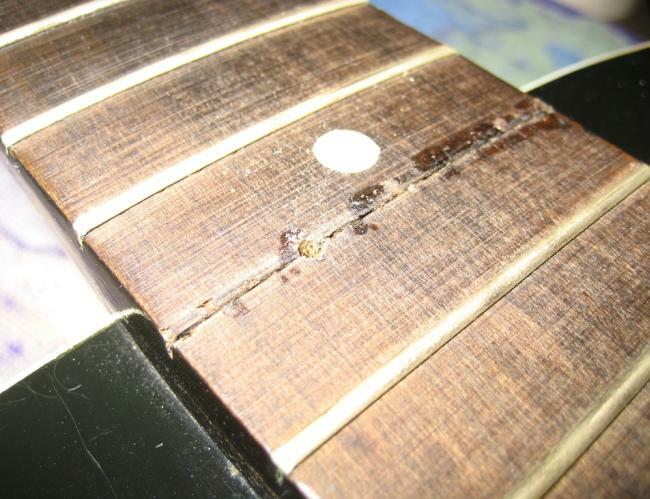 Also, it's likely to cause a hump at the joining fret.